The idea that a few bankers control a large chunk of the global economy might not seem like news to New York’s Occupy Wall Street movement and protesters elsewhere. But the study by a trio of complex systems theorists at the Swiss Federal Institute of Technology in Zurich is the first to go beyond ideology to empirically identify such a network of power. 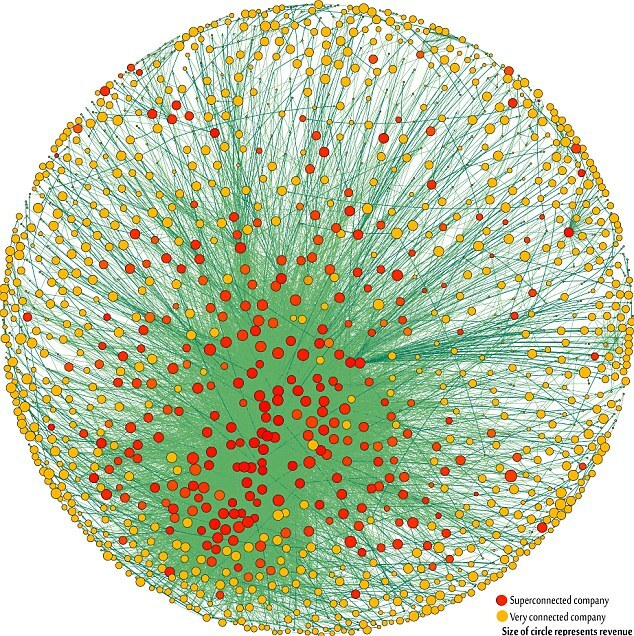 It combines the mathematics long used to model natural systems with comprehensive corporate data to map ownership among the world’s transnational corporations (TNCs). The study determines that global corporate control is far more concentrated than many people think: a core of just 147 firms — many of them financial companies — control 40 percent of the wealth of 43,060 transnational corporations. A broader core of 737 control 80 percent, according to the theorists. Creating a ‘map’ of 1,318 companies at the heart of the global economy, the study found that 147 companies formed a super entity within this, controlling 40 per cent of its wealth. All own part or all of one another. Most are banks – the top 20 includes Barclays and Goldman Sachs. But the close connections mean that the network could be vulnerable to collapse. says James Glattfelder, a complex systems theorist at the Swiss Federal Institute in Zurich, who co-wrote the research. Some of the assumptions underlying the study have come in for criticism – such as the idea that ownership equates to control. But the Swiss researchers simply applied mathematical models usually used to model natural systems to the world economy. Moreover, the value of the study wasn’t to see who controlled the global economy, but the tight connections between the world’s largest companies. The financial collapse of 2008 showed that such tightly-knit networks can be unstable. The data used by the Swiss theorists was from 2007. IMHO that ownership is even more concentrated now. For example, Barclays is at the top of the list from the 2007 data. But Lehman Brothers, which was acquired out of bankruptcy by Barclays, is also on the list. The global financial consolidation that followed the financial crisis has only made the concentration worse.